::(Welcome to Island Pearl Holidays, Maldives - You’re Exclusive Luxury Private Island…The Island Hideaway at Dhonakulhi, Spa Resort & Marina is a new luxury boutique resort development situated on the privately-owned uninhabited virgin island of Dhonakulhi, North Maldives, Indian Ocean. 45 minutes flight from Male’ International Airport to Hanimaadhoo Domestic Airport, followed by an exhilarating 20 minute speed boat ride to Dhonakulhi. Guests may also fly-in on seaplanes or private jets or cruise their yachts to the Island’s fully equipped world class Marina. The Island Hideaway at Dhonakulhi, Spa Resort & Marina is a new luxury boutique resort development situated on the privately-owned uninhabited virgin island of Dhonakulhi, North Maldives, Indian Ocean. Resort, with 6 types of spectacular guest villas, open in August 2005. Marina is the first of its kind in the Maldives. The Island is a haven of peace, tranquility and serenity. The Island Hideaway is the only resort in the entire Haa Alif and Haa Dhal Atolls of the North Maldives. The Island Hideaway in the North of the Maldives by a 35-minute scenic photo-flight from the international airport at Malé, the capital city, to Hanimaadhoo (Domestic) Airport followed by an exhilarating short speedboat hop to Dhonakulhi Island. Guests may also fly-in on seaplanes or private jets or cruise their yachts direct to the Island’s fully-equipped world class marina. Dhonakulhi is a physically large crescent-shaped island with a beach length of some 1.4 kilometres on each side, a width of 500 metres and land area of 234,000 m² – equivalent to 28 football pitches. The crystal clear turquoise waters of the shallow waistdeep lagoon surrounding the Island stretch as far as the eye can see. The Island is unique in its reef formation, the reef system it sits on having a natural channel splitting it in two distinct parts, and thereby forming a natural harbour for the marina. In addition to coconut trees, banana trees and rubber-tree-like vegetation, the Island is covered by uniquely rich dense bushy vegetation. hand-finished natural materials throughout. At the same time, however, guests can indulge all their senses in the magic of this Maldivian Island and enjoy every exclusive luxury which sophisticated globetrotters have come to expect. Despite the extensive facilities and services at The Island Hideaway, we have utilized barely 5% of the Island and lagoon, thereby leaving 95% in its original state, untouched by the hand of man. Designed an intimate, luxurious resort, with exceptional levels of attention to detail, the resort is rusic celebration of nature, with custom-made, hand finished natural materials used throughout. A stay in these havens of peace and serenity will leave yuu fresh, revitalised and rejuvenated! 7 - Funa Pavilion (Land area of176 sq.m per villa), characterised by its own garden, a separate sleeping and living area with teak flooring, open-air bathroom and a wooden patio facing the beach. 7 - Rambaa Retreat (Land area of 385 sq.m per villa),the elegantly rutic villas, with their open floor level outdoor terraces and landscaped gardens offer the perfect seclusion for a peaceful retreat. 20 - Dhonakulhi Residence with Jacuzzi Splash Pool (Land area of 550 sq.m per villa), scattered along the white sandy beach-front, has an open living area with a timber deck outdoor seating. The French-windowed spacious bedroom overlooks its own jacuzzi Splash Pool. 2 - Spa Water Villa with Jacuzzi Whirlpool (Land area of 235 sq.m per villa), erected on wooden stills in the shallow turquoise-blue lagoon, our two stand-alone villas, have their own exclusive ocean-view treatment room, sauna, steam room and an outdoor "Hanging" jacuzzi whirlpool. 5 - Jasmine Garden Villa (Land area of 705 sq.m per villa), with its own excluisve 9.5m by 4m infinity swimming ool, a floating dining pavilion over the ool and a private terrace with an amazing viw. The bedroom with a large walk-in closet and en-suite bath room, has an exquisite "two person" hand-crafted bath. 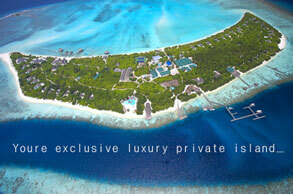 2 - The Hideaway Palace (Land area of1420 sq.m per villa), reresents the epitome of refinement, grandeur and privacy. Each palace, located by a golden natural sandbank, comprises of eight individual villas, erected on a timber deck, sorrounded by a number of infinity swimming pools, giving an effect of a floating Palace! 24-hour Reception, Multilingual staff, Foreign currency exchange, Laundry & valet service, The Hideaway Library (books, magazines, games, music CDs, DVDs and cyber cafe), The Hideaway Bazaar, Sifani Jewellery Boutique, Creche & Kids Club, The Hideaway Marina (a fully-equipped state of the art Marina, built by Walcon Marine). Infinity Swimming Pool, The Hideaway Spa (managed by Mandara Spa, Fully-equipped diving school managed by Meridis Dive, Water Sports Centre, Tennis, Beach Volleyball, Fitness Centre, Bicycle Riding & Jogging, Yoga & Silat, Organic Vegetables & Hydroponics garden, Sunset fishing, Night fishing, Big Game fishing, Cultural Excursions. The Hideaway Marina: We are delighted to introduce the first Marina in the Maldives. A fully-equiped, state of the art marina, built by Walcon Marine - a well know Marina builder.